The second recipe test for Hannah's new book - turned out awesome - it's super easy to make: a sweetened coconut crust with a filling of sweetened cherries with a bit of almond essence. Very tasty - I thought the crust would be crispier instead of chewier, but it lasted several days before soaking up the juice from the cherry filling. It was delicious at all stages! 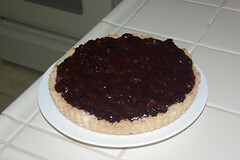 I loved the flavors of this tart. I'll definitely make it again.